Tokyo (CNN) -- Helicopters dumped water Thursday on and near the Nos. 3 and 4 units at Japan's Fukushima Daiichi nuclear plant in the latest attempt to halt the nuclear accident that appeared to be spinning out of control. The helicopters belong to the nation's self-defense forces, public broadcaster NHK reported. Initially, just a few drops were carried out before the operation was suspended. An NHK commentator said about 100 would be needed for the operation to succeed. During the afternoon, engineers were planning to begin the process of restoring power to the stricken nuclear complex, a government official said. 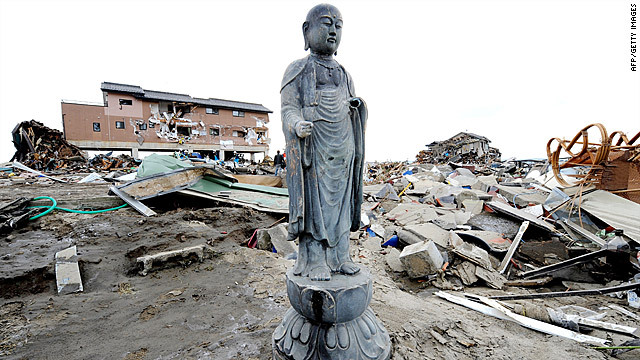 The complex lost its power Friday, when a 9.0 earthquake followed by a tsunami hammered northeastern Japan. "Today, we are trying to restore the power supply using the power lines from outside," said the official with the Nuclear and Industrial Safety Agency. "This is one of the high-priority issues that we have to address." When will the Japan crisis end? How bad is Japanese radiation risk? Once the power supply has been re-established, the cooling system will be operated using seawater, he said. But he warned that the process will not be immediate. "It will take time to restore the function of the main part of the facilities, because the pumps were contaminated by seawater and must be repaired before reuse," he said, adding that temporary pumps would be used initially. The move came a few hours after the head of the U.S. Nuclear Regulatory Commission testified that spent fuel rods in Unit 4 of Japan's stricken Fukushima Daiichi nuclear plant had been exposed, resulting in the emission of "extremely high" levels of radiation. "What we believe at this time is that there has been a hydrogen explosion in this unit due to an uncovering of the fuel in the fuel pool," Gregory Jaczko told a House energy and commerce subcommittee hearing Wednesday. "We believe that secondary containment has been destroyed and there is no water in the spent fuel pool, and we believe that radiation levels are extremely high, which could possibly impact the ability to take corrective measures." A Japanese government spokesman, Noriyuki Shikata, said he saw Jaczko's testimony, but could not confirm it. "I cannot comment on the basis of the testimony itself," he told CNN. Asked about the report of a high level of radioactivity near the plants, he said, "We have not seen the level that is, for example, dangerous to human bodies beyond the very close vicinity of the reactors." In addition, he said, "we have not seen a major breach of containment." The water served to both cool the uranium fuel and shield it. But once the uranium fuel was no longer covered by water, the zirconium cladding that encases the fuel rods heated, generating hydrogen, said Robert Alvarez, senior scholar at the Institute for Policy Studies and a former official with the Department of Energy. That caught fire, resulting in a situation that is "very, very serious," he told CNN. He said the next step may involve nuclear plant workers taking heroic acts. Asked to be more specific, he said, "This is a situation where people may be called in to sacrifice their lives. ... It's very difficult for me to contemplate that but it's, it may have reached that point." Photographs of the building released Wednesday by the power company showed a hole in a wall and deterioration of the roof. A Japanese Self-Defense Force helicopter aborted its mission Wednesday to drop water over the reactor because of the high radiation levels in the area, Japanese public broadcaster NHK reported Wednesday. Officials have been working to resolve cooling problems at four of Fukushima Daiichi's six reactors in the wake of the 9.0-magnitude earthquake and tsunami that devastated northeast Japan Friday. The International Atomic Energy Agency said the temperature of water in spent fuel pools is typically kept below 25 degrees Celsius (77 degrees Fahrenheit). That requires a constant cooling source, which requires a constant power source, something not available at the plant in the aftermath of Friday's earthquake and tsunami. 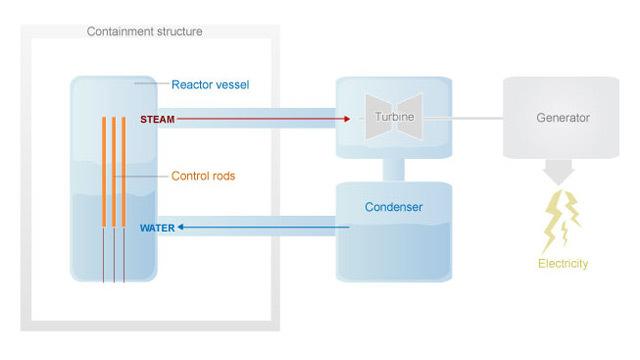 "The concern about the spent fuel pools at Fukushima Daiichi is that sources of power to cool the pools may have been compromised," IAEA said in a statement. It listed the temperatures at the spent fuel pools Tuesday as 84.0 degrees C (183 F) at Unit 4; 60.4 degrees C (141 F) at Unit 5 and 58.5 degrees C (137 F) at Unit 6. By Wednesday, it was reporting "no data" for Unit 4 and worrying trends for the other two: Unit 5 had risen to 62.7 degrees C (145 F) and Unit 6 had risen to 60.0 degrees C (140 F). Three of the reactors were operating at the time of Friday's 9.0 earthquake and were shut down following their normal procedures, Jaczko said. All of them, he said, appeared to have suffered "some degree of core damage from insufficient cooling caused ultimately by the loss of off-site power and the inability of the on-site diesel generators to operate successfully following the tsunami." Three reactors were being cooled with seawater and their primary containment vessels were described as "functional," he said. But core cooling was "not stable" for unit No. 2, he said. Though the primary containment appeared to be functioning, "we believe that the spent fuel pool level is decreasing." At unit No. 3, he said, the integrity of the spent fuel pool appeared to have been compromised and there may have been a reaction between the zirconium cladding and the water. Jaczko's grim announcement confirmed fears that the nuclear crisis would worsen. 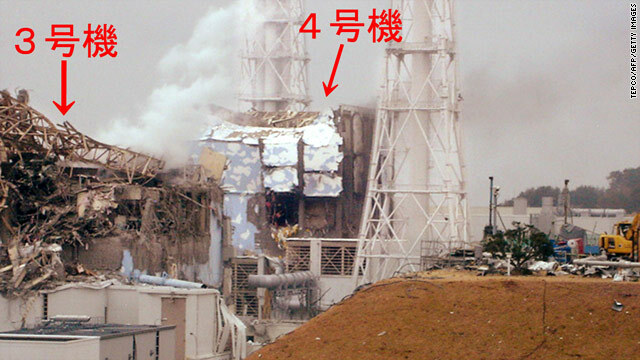 They had already heightened earlier in the day, when officials observed white vapor rising from the Fukushima Daiichi nuclear plant's reactor No. 3. Tests on tap water in Fukushima city, 80 kilometers (50 miles) away, found radiation, though at levels not harmful to the human body, and later tests showed no radiation in the water, government officials said. IAEA Director General Yukiya Amano said Wednesday he will travel to Japan "as soon as possible, hopefully (Thursday)" to get the latest on the situation and to see how the U.N.'s nuclear watchdog agency can best help Japanese authorities, he said. He will stay one night, he added. In Washington, military officials said Wednesday they had deployed an atmospheric detection aircraft, the WC-135W Constant Phoenix, to assist in detecting radioactive materials in the atmosphere around Japan. The plane, normally based at Offutt Air Force Base in Nebraska, was moved Tuesday to Eielson Air Force Base in Alaska to prepare for its first sortie, the officials said. The aircraft can "detect radioactive 'clouds' in real time," according to the Air Force. Japan's chief cabinet secretary, Yukio Edano, initially said a breach in the containment vessel -- the steel and concrete shell that insulates radioactive material inside the reactor -- may have been the cause of Wednesday's white vapor. But he said later it was unlikely that the vessel suffered severe damage, the Kyodo news agency reported. Officials told workers at the plant to evacuate Wednesday after the vapor rose above the plant and radiation levels spiked. 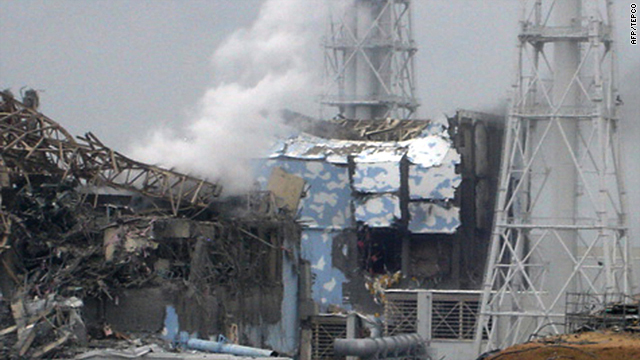 Radiation levels later fell, and authorities allowed the workers to return, the Tokyo Electric Power Company said. The number of nuclear workers remaining on site was slashed Tuesday from 800 to 50 but had grown to 180 by Wednesday afternoon, the power company said. About 200,000 people living within a 20-kilometer radius of the plant have been evacuated; those living 20 to 30 kilometers from the site have been told to remain inside. Authorities also have banned flights over the area. But the Japanese precautions were not universally embraced. Britain's foreign ministry joined the U.S. Embassy in Tokyo late Wednesday in asking their respective citizens to evacuate or take shelter indoors if they live within 50 miles (80 kilometers) of the Fukushime Daiiachi plant, both nations said in separate statements. "Their standards are different from ours based on how far you should evacuate," White House spokesman Jay Carney said Wednesday. He called the situation "very fluid." That view was confirmed by NRC's Jaczko. "For a comparable situation in the United States, we would recommend an evacuation to a much larger radius than has currently been provided in Japan," he said. The U.S. military also said it will not allow troops within 50 miles of the plant, Col. David Lapan, a Pentagon spokesman, said Wednesday. U.S. President Barack Obama was briefed Wednesday by the chairman of the U.S. Nuclear Regulatory Commission on the "deteriorating situation" of the damaged nuclear reactors, Carney said. The weather has emerged as a key concern, but on Wednesday afternoon, winds were blowing out to sea, CNN International Meteorologist Jennifer Delgado said. 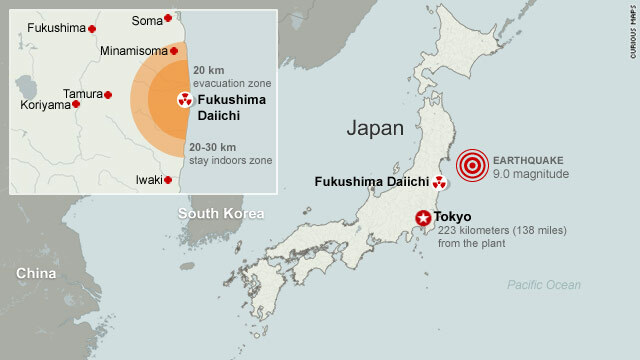 As a result of the monitoring of about 150 people from around the Daiichi site, 23 have been decontaminated, IAEA said. "Their situation is not great," said David Brenner, director of the Center for Radiological Research at Columbia University. "It's pretty clear that they will be getting very high doses of radiation. There's certainly the potential for lethal doses of radiation. They know it, and I think you have to call these people heroes." A meltdown occurs when nuclear fuel rods cannot be cooled and the nuclear core melts. In the worst-case scenario, the fuel can spill out of the containment unit and spread radioactivity through the air and water. That, public health officials say, can cause both immediate and long-term health problems, including radiation poisoning and cancer. CNN's Stan Grant, Steven Jiang, Barbara Starr, Sabriya Rice, Elise Labott and Richard Greene contributed to this report.